(Reuters) - PG&E Corp, owner of the biggest U.S. power utility by customers, said on Monday it is preparing to file for Chapter 11 bankruptcy protection as soon as this month amid pressure from potentially crushing liabilities linked to California's catastrophic wildfires in 2017 and 2018. Its shares plunged 52 percent on Monday to $8.38, giving it a market capitalization of less than $4.5 billion. The stock is down more than 80 percent from late 2017, before wildfires devastated PG&E's service areas. Bond prices also fell sharply on Monday. PG&E's chief executive officer was replaced on Sunday by General Counsel John Simon on an interim basis. In theory, California politicians could avert PG&E's bankruptcy with legislative action. Last year, the state approved a law helping utilities recoup costs from fires in 2017, but not blazes in 2018. California's average rate is 16 cents per kilowatt hour, while those in neighboring Oregon and in Washington state are about half as much, according to data from the U.S. Energy Information Administration provided by energy consulting firm McCullough Research. The U.S. average is 10 cents per kilowatt hour. Moody's and Standard & Poor's recently cut PG&E's credit rating into junk territory, citing concerns about wildfire liabilities. On Monday, Moody's and S&P cut PG&E's ratings again and Fitch downgraded the California power company and its Pacific Power & Gas Co unit to junk. 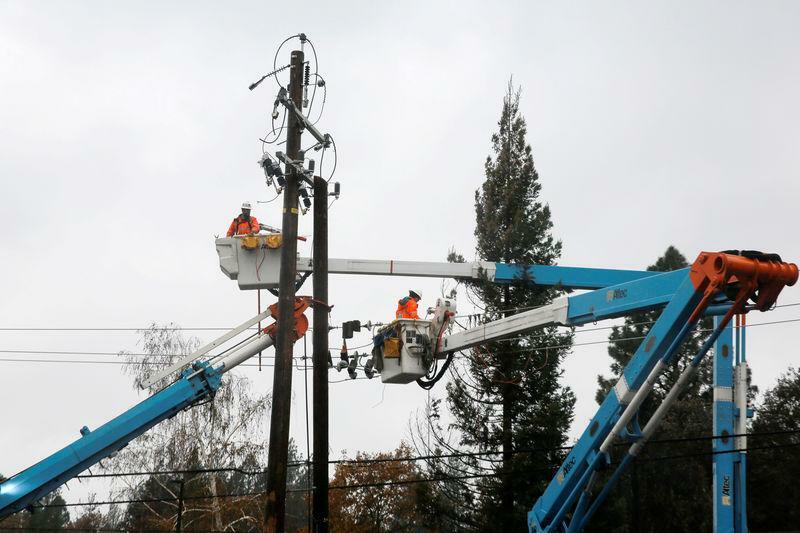 PG&E said it could face "significant liability" in excess of its insurance coverage if its equipment was found to have caused the Camp Fire that swept through the California mountain community of Paradise last November. PG&E's liabilities from that fire could be catastrophic if authorities determine its equipment caused the blazes. Under California law, utilities are exposed to liability from wildfires regardless of their negligence. The company decided to prepare to file for bankruptcy in part to address that issue, known as "inverse condemnation." Energy companies that supply PG&E could be hit by its bankruptcy. One of the most exposed is Kinder Morgan Inc, the second-largest North American pipeline operator, analysts said. The company's board ousted CEO Geisha Williams and decided to undergo a restructuring at a meeting over the weekend in San Francisco, according to a source familiar with the matter. Williams had served as CEO since March 2017, before the fatal blazes.